The metabolism of [2-acetyl-14C]oseltamivir (GS4104, Ro 64-0796), the prodrug of the novel influenza neuraminidase inhibitor GS4071 (Ro 64-0802), was examined in rats after oral dosing. Intact oseltamivir was observed only in lung and urine, accounting for 37 and 15% of the total radioactivity in these samples, respectively. GS4071 was the major metabolite in plasma, tissues, and urine, and accounted for 32 to 56% of the radioactivity present in these samples. The second most abundant peak in these samples (13–24% of radioactivity) was a novel metabolite (M3). This metabolite was purified from urine of rats dosed orally with oseltamivir and was identified by liquid chromatography-mass spectrometry and NMR as the (R)-ω-carboxylic acid metabolite of oseltamivir. The ω-carboxylic acid metabolite of oseltamivir could not be produced in vitro. However, ω-hydroxylated products of oseltamivir were produced by rat liver microsomes. Both the (R)- and (S)-ω-hydroxylated products were observed, but formation of the (R)-isomer predominated. These data indicated that in the rat, oseltamivir was primarily metabolized to the active influenza neuraminidase inhibitor GS4071 and, to a lesser extent, to an (R)-ω-carboxylic acid metabolite. GS4071 [(3R,4R, 5S)-3-(1-ethylpropyloxy)-4-acetamido-5-amino-1-cyclohexene-1-carboxylate, [2-acetyl-14C]oseltamivir, Ro 64-0802]3 is a novel agent for the treatment of flu. This compound is a potent inhibitor of influenza neuraminidase (Kim et al., 1997), an enzyme important for influenza replication in that it facilitates release of newly formed virus particles from infected cells (Seto and Rott, 1966; Palese and Compans, 1976). Neuraminidase may also aid the passage of virus through respiratory mucus allowing access of virus to epithelial cells of the lung (Burnet, 1948). Because the active site of neuraminidase is highly conserved in all strains of flu (Air and Laver, 1989), this enzyme represents an ideal chemotherapeutic target against influenza infection. Because the oral bioavailability of GS4071 is poor, it is administered as its ethyl ester prodrug (oseltamivir, ethyl-(3R,4R, 5S)-3-(1-ethylpropyloxy)-4-acetamido-5-amino-1-cyclohexene-1-carboxylate, GS4104, Ro 64-0796). Administration of oseltamivir has been shown to greatly enhance the bioavailability of GS4071 in various species (Li et al., 1998), and good penetration of GS4071 into the lower respiratory tracts of rats has been demonstrated after oral administration of its prodrug (Eisenberg et al., 1997). Oseltamivir was shown to be efficacious in a number of animal models for flu. Recently, oseltamivir phosphate was the first orally active neuraminidase inhibitor approved for the treatment of influenza A and B infection. This study describes the metabolite pattern in selected tissues and urine of rats after oral administration of oseltamivir. The major novel metabolite of oseltamivir formed in rats is also identified. [2-Acetyl-14C]oseltamivir hydrochloride salt (59 mCi/mmol) was synthesized by Moravek Biochemicals, Inc. (Brea, CA). Unlabeled oseltamivir hydrochloride salt and GS4071 were synthesized by Gilead Sciences. Standards of the (R)-ω-carboxylate oseltamivir metabolite, (S)-ω-carboxylate oseltamivir metabolite, (R)-ω-hydroxyl oseltamivir metabolite, and (S)-ω-hydroxyl oseltamivir metabolite were synthesized as described (Lew et al., 1999). NADP+, glucose 6-phosphate, glucose 6-phosphate dehydrogenase, and BSA were obtained from Sigma Chemical Company (St. Louis, MO). Strong cation exchange (SCX, 500 mg) and C-18 Sep Pak (35 cc, 10 g) sample prep columns were obtained from Alltech (Deerfield, IL) and Waters (Milford, MA), respectively. The scintillation fluid for HPLC radioactivity determination (Flo Scint A) was obtained from Packard (Meriden, CT). Studies used male Sprague-Dawley rats (233–271 g) and were performed in accordance with the recommendations of the Guide for the Care and Use of Laboratory Animals, and the Institutional Animal Care and Use Committee-approved protocols. For the tissue distribution and excretion study, three groups of four rats were administered a single oral dose of [2-acetyl-14C]oseltamivir (10 mg/kg, 104 μCi/kg). One group of rats was placed into metabolism cages, and urine and feces were collected over the next 24 h. The other groups of rats were sacrificed 1 and 6 h after dosing, and tissues were collected. The HPLC pattern of oseltamivir-derived radioactivity were determined in four additional rats that received a single dose of [2-acetyl-14C]oseltamivir (10 mg/kg, 104 μCi/kg) by oral gavage. A single rat was sacrificed 1 h after dosing. Plasma was obtained and then the rat was perfused via the inferior vena cava with 100 ml of 0.9% saline, after which lung and liver samples were obtained. Urine samples were collected from the remaining rats for 24 h after dosing. Urine used for the purification of the novel oseltamivir metabolite was obtained from an additional three rats (250–300 g) orally dosed [2-acetyl-14C]oseltamivir (10 mg/kg, with 0.67 μCi [14C]oseltamivir/mg unlabeled drug). Rats were dosed twice daily for 3 days, and urine was collected daily. Urine was kept frozen (−70°C) until used for metabolite purification. Analysis of Tissue, Plasma, and Urine Radioactivity. Total radioactivity in urine, cage rinse, and plasma samples were determined directly by liquid scintillation counting. Liver, small intestine, large intestine, and contents of the stomach and intestine were homogenized in water; radioactivity was determined by liquid scintillation counting. Radioactivity in all other tissues was determined after sample combustion in a Packard model 307 tissue oxidizer. For determination of the radioactivity profile, samples of lung (one entire lung) and liver (1 g) were homogenized using an Ultraturrax tissue disrupter. Homogenates were centrifuged at 4000 rpm (1300g) in an Eppendorf model 5402 centrifuge for 10 min at 4°C. The resulting supernatants were transferred to 0.2 μm Z-spin centrifugal filter units (Gelman Sciences, Ann Arbor, MI) and centrifuged at 14,000 rpm (15,000g) for 15 min, and the filtrates were retained. Urine and plasma samples were centrifuged using 10,000-molecular-weight cutoff filter units (Millipore, Bedford, MA) at 14,000 rpm for 15 min. All filtrates were subsequently analyzed by using a gradient HPLC method. The HPLC column was a Keystone Inertsil C-18 column (0.4 × 125 cm, 5-μm particle size). Mobile phase A was 50 mM ammonium acetate, whereas mobile phase B was 60% acetonitrile-50 mM ammonium acetate. Initial conditions were 90% mobile phase A/10% mobile phase B; separation was achieved by running a linear gradient to 100% B over 20 min. Flow rate was 1.0 ml/min, UV detection was at 220 nm. Radioactivity was monitored using a Radiomatic Flo-One in line detector (Packard, Meriden, CT). Total recovery of radioactivity from the urine injected on the HPLC column was greater than 92%; recovery from the plasma and tissues was not determined. Isolation of the Major Novel Metabolite of Oseltamivir (M3). The major novel oseltamivir metabolite (M3) was purified from rat urine using a multistep procedure that used both solid-phase extraction and HPLC techniques. In the initial step, urine (25 ml) was acidified (pH 2.0) with 1 N HCl and placed onto a C-18 Sep pak column. The column was washed with 50 ml of water, followed by 25 ml of acetonitrile. The acetonitrile effluent was collected and evaporated to dryness on a model SVC 100H (Savant, Farmingdale, NY) speedvac concentrator. The dried material was resuspended in 7 ml of water, split into two equal volumes and placed onto two SCX columns. The SCX columns were washed with 10 ml of water, followed by 8 ml of a 50% acetonitrile-0.5 M ammonium acetate mixture. The effluent was evaporated to dryness overnight and subsequently resuspended in 1 ml of water. M3 was further purified using two reversed phase HPLC separations. Both HPLC separations used an Inertsil C-18 column (0.4 × 125 cm, 5-μm particle size). Elution time of M3 was followed by monitoring UV absorbance at 220 nm and by using a Radiomatic Flo-One in line detector. The first HPLC separation used the gradient method described above. The fraction of effluent containing M3 was collected, evaporated to dryness, and resuspended in 1 ml of water. The resuspended sample was injected directly onto the second HPLC system using isocratic separation. The mobile phase was a 84:16 (v/v) mixture of 0.6% acetic acid (pH 2.9) and 60% acetonitrile-50 mM ammonium acetate. The flow rate was 1.0 ml/min. M3 was collected and evaporated to dryness. Mass Spectral and NMR Analysis of M3. An aliquot (1–2 μg) of the purified metabolite was analyzed by thermospray mass spectrometry using a Vestec model 201 mass spectrometer. Before NMR analysis, the purified metabolite was resuspended in D2O (8 ml) and then evaporated to dryness to remove excess H2O. The dried material was subsequently reconstituted in D2O and analyzed by NMR. NMR analysis was performed using a Varian Unity Plus 500 NMR spectrometer. In Vitro Hepatic Microsomal Metabolism of Oseltamivir. Rat hepatic microsomes were used to elucidate the pathway leading to formation of M3. Rat hepatic microsomes were prepared by established methods and were resuspended in 0.15 M KCl and stored at −70°C until used. Microsomal protein content was determined by the Bio-Rad protein assay (Bio-Rad Laboratories, Richmond, CA), using BSA as standard. Metabolism assays were performed in 13 × 100-mm glass test tubes at 37°C. Incubation volume was 1 ml and consisted of 0.1 M Tris buffer (pH 7.4, 37°C), 5 mM MgCl2, 2 mg microsomal protein, oseltamivir, and an NADPH generating system (i.e., 8 mM glucose 6-phosphate, 1 mM NADP+, and 1 U glucose 6-phosphate dehydrogenase). Oseltamivir concentrations used in studies for metabolite generation were between 20 and 50 μM. All incubations contained 0.1 μCi [2-acetyl-14C]oseltamivir. Reactions were initiated by the addition of microsomes and terminated at 0, 30, and 60 min by removing 0.1 ml of the assay mixture and adding to 0.2 ml of acetonitrile. The precipitate was removed by centrifugation and the supernatant was evaporated to dryness using a speedvac. Samples were resuspended in water and analyzed by the gradient HPLC method described above. Tisssue Distribution and Elimination of [14C]Osteltamivir. Concentrations of 14C radioactivity in representative tissues obtained 1, 6, and 24 h after oral dosing of oseltamivir are shown in Table 1. At 1 h after dosing, radioactivity was widely distributed with the highest tissue concentrations being observed in the small intestine, liver, stomach, and kidneys. Tissue concentrations of radioactivity, with the exception of large intestine, were lower at 6 h and were still detectable 24 h after dosing. Total 24 h recovery of 14C radioactivity from rats orally dosed oseltamivir was 93.2%, with 61.1 and 24.27% of the radioactive dose being excreted in the feces and urine, respectively. The remainder of the radioactivity was found in the cage rinse (4.6%) and tissues (3.3%). Urine and Tissue Radioactivity Profile. The profile of radioactivity in urine, plasma, and selected tissues is shown in Fig. 1. At least seven distinct radioactive peaks accounted for the majority of radioactivity present in urine. GS4071 was the major urinary metabolite of oseltamivir (Table 2). The second most abundant peak in urine was a novel metabolite (M3) that eluted just before GS4071. Oseltamivir was the third most abundant species, whereas four unidentified metabolites accounted for the remainder of urinary radioactivity. In plasma and tissues obtained 1 h after dosing, oseltamivir was detected in lung, but not in plasma or liver. GS4071 and M3 accounted for the majority of radioactivity in both plasma and liver. The remainder of tissue and plasma radioactivity was attributable to metabolites similar to those observed in urine. Representative radiochromatograms of rat urine, plasma, liver, and lung after a single oral dose of [14C]oseltamivir. Urine profile is from a 24-h pooled sample, whereas plasma, liver, and lung profiles are 1 h after dosing. A total of 172 μg of M3 was purified from urine of rats orally dosed with oseltamivir. The mass spectrum of the purified M3 demonstrated a protonated molecular ion at 343, indicating that the molecular weight of the metabolite was 30 atomic mass units greater than oseltamivir and 58 atomic mass units greater than GS4071. The base peak in the mass spectrum of M3 was at 243, and fragment ions at 226 and 197 were also observed. GS4071 exhibited a protonated molecular ion at 285, and fragment ions that resulted from the loss of H2O (i.e., 267 ion) or the ethylpropyloxy side chain (i.e., 197 ion). Oseltamivir exhibited a protonated molecular ion at 313, and fragment ions at 295 and 225, which correspond to the loss of H2O (18 mass units) and the ethylpropyloxy side chain (88 mass units, C5H11O), respectively. The 1H-NMR spectrum for M3 in D2O was similar to that of oseltamivir, although a number of noticeable differences were observed (Table3). No changes were apparent in the chemical shifts of protons associated with the cyclohexene ring or the acetamindo function of the metabolite. The presence of proton signals at 1.31 and 4.27 ppm in the metabolite indicated that the ethyl ester group was still intact. Moreover, the absence of a proton signal at 0.87 ppm indicated the loss of protons associated with one of the terminal carbons of the ethylpropyloxy function. Chemical shifts were also apparent in protons of adjacent carbon atoms (i.e., C10 and C13), further supporting the conclusion that metabolic changes had occurred at one of the terminal carbons of the ethylpropyloxy function. The COSY spectrum of metabolite M3 (data not shown) showed evidence of coupling between the proton at 4.0 ppm (CH at C10) and the protons at 2.5 and 2.4 ppm (CHa,b at CH13). The HMBC spectrum of M3 (data not shown) indicated that there were three carbonyl functions in the metabolite. The carbonyl at 175.6 ppm was coupled to the methyl protons at 2.15 ppm (C15), and the carbonyl at 167.9 ppm was coupled to the proton at 4.30 ppm (C7). These carbonyl functions are present in both oseltamivir and GS4071. The additional carbonyl at 180.2 ppm was coupled to the methylene (C13) protons at 2.40 and 2.55 ppm. From the NMR data, M3 was identified as an omega (ω) carboxylic acid metabolite of oseltamivir. This structure was consistent with the molecular weight of the metabolite determined by liquid chromatography-mass spectrometry (LC-MS). Coelution of M3 with Authentic Standard. Oxidation of the ω carbon of the ethylpropyloxy side chain of oseltamivir to a carbonyl function would have introduced an additional chiral center into the molecule, making the ω-carboxylic acid metabolite diestereomeric. Therefore, two distinct ω-carboxylic acid metabolites were possible. The diesteromers were found to have markedly different HPLC retention (Fig.2), and based on coelution studies, M3 was identified as the (R)-ω-carboxylic acid metabolite of oseltamivir. 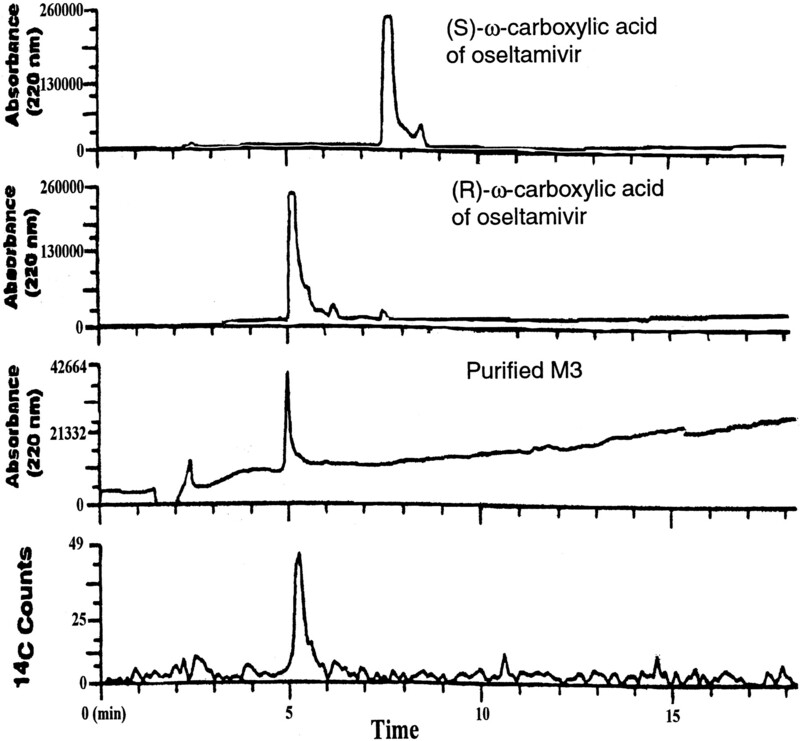 HPLC chromatograms of (S)-ω-carboxylic acid oseltamivir standard, (R)-ω-carboxylic standard, and purified M3. Hepatic Microsomal Metabolism of Oseltamivir. 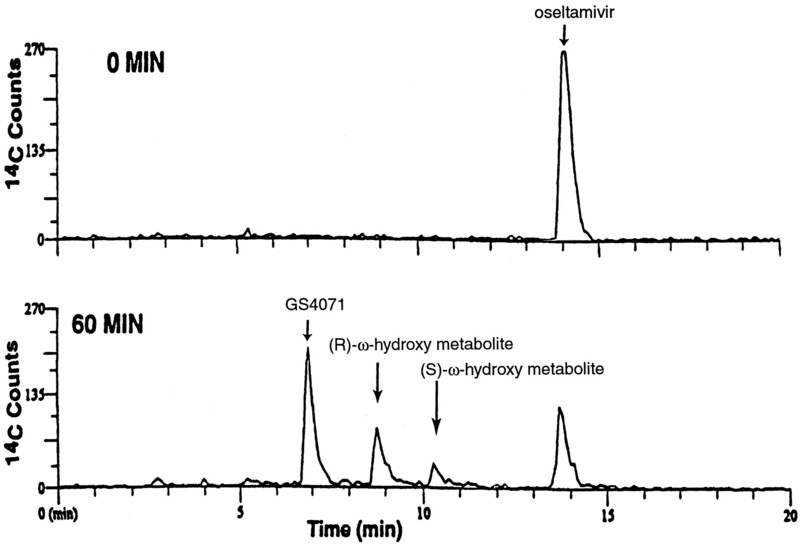 The (R)-ω-carboxylic acid metabolite of oseltamivir was not detected in vitro in hepatic microsomal studies. However, incubation of [2-acetyl-14C] oseltamivir with microsomes in the presence of an NADPH generating system led to the formation of two distinct metabolite peaks (Fig.3). No metabolites were formed in the absence of an NADPH generating system. Moreover, formation of these metabolites was reduced 50% by treating hepatic microsomes with carbon monoxide, a nonspecific inhibitor of cytochrome P-450, before incubation with oseltamivir. LC-MS analysis of the incubation mixture demonstrated that both of the metabolites had molecular weights that were 16 mass units great than that for oseltamivir (data not shown). Based on coelution studies with authentic standards, the major microsomal metabolite was identified as (R)-ω-hydroxy oseltamivir, whereas the later eluting metabolite coeluted with (S)-ω-hydroxy oseltamivir. At the oseltamivir concentrations used in these studies, the formation of the (R)-ω-hydroxy oseltamivir metabolite predominated 2- to 3-fold over the formation of the (S)-ω-hydroxy oseltamivir. Metabolism of [14C]oseltamivir by rat hepatic microsomes. The major route of metabolism for oseltamivir after oral administration to rats was ester hydrolysis as demonstrated by GS4071, the active neuraminidase inhibitor, being the major metabolite observed in tissues, plasma, and urine. The second most abundant peak in the plasma, urine, and liver samples was a novel metabolite (M3) that eluted just before GS4071 by HPLC. Formation of M3 was not detectable using hepatic microsomes. Therefore, it was isolated from urine of rats orally dosed oseltamivir. Because M3 was fairly hydrophilic, purification from urinary components required a complex series of solid-phase extraction and HPLC steps. Definitive structural identification of M3 was obtained using NMR and LC-MS. From the NMR and mass spectral data, the metabolite was identified as an ω-carboxylic acid metabolite of oseltamivir. Because oxidation of the terminal carbon would have introduced an additional chiral center into oseltamivir, two possible diestereomers of the ω-carboxylic metabolite were possible. Based on HPLC coelution with an authentic chemically synthesized standard, M3 was identified as the (R)-ω-carboxylic acid metabolite of oseltamivir. The (S)-ω carboxylic acid metabolite of oseltamivir was not observed in vivo, suggesting that the process leading to the formation of the ω-carboxylic acid metabolite was stereoselective. A number of compounds such as lauric acid (Hamberg and Bjoekhem, 1971), mono-2-ethylhexyl phthalate (Albro et al., 1984), and 2–2-dimethyl-N-(2,4,6-trimethoxyphenyl) dodecanamide (CI-976; Sinz et al., 1997) have been shown to undergo ω-oxidation to carboxylic acid metabolites similar to that observed for oseltamivir. The initial step in the formation of these metabolites has been suggested to be a cytochrome P-450-mediated oxidation to ω-hydroxyl metabolites. Incubation of oseltamivir with rat hepatic microsomes and an NADPH generating system led to the formation of two distinct radioactive metabolites. These metabolites appeared to be formed by a cytochrome P-450-dependent reaction, as no metabolite formation was observed in the absence of an NADPH generating system, and metabolite formation was markedly reduced by carbon monoxide. Based on mass spectral data and coelution with authentic standards, these metabolites were identified as the (R)- and (S)-ω-hydroxy metabolites of oseltamivir. These ω-hydroxy metabolites eluted from HPLC with similar retention times as the M4 and M5 metabolites that were observed in the rat in vivo. Therefore, M4 and M5 are probably the (R)- and (S)-ω-hydroxy metabolites of oseltamivir, but this was not confirmed. Some researchers have suggested a cytochrome P-450 involvement in the conversion of the ω-hydroxylated compounds to ω-carboxylic acid products, as a purified recombinant fusion protein containing CYP A1 and NADPH-P450 reductase has been shown to convert lauric acid to its ω-carboxylic acid metabolite (Shet et al., 1996). On the other hand, it has also been suggested that a cytosolic NAD-dependent process (e.g., alcohol dehydrogenase) may be involved in the conversion of the hydroxylated products to ω-carboxylic acid products (Christensen et al., 1991; Kundu et al., 1993). In our microsomal studies, no M3 formation was observed. The reason for our inability to form M3 in vitro with hepatic microsomes is not fully understood, but may result from the low rate of production of the ω-hydroxylated product or from the absence of enzyme(s) responsible for catalyzing the conversion of the ω-hydroxylated product to the ω-carboxylic acid metabolite. Additional studies are in progress to determine the process by which the (R)-ω-hydroxy metabolite of oseltamivir is converted to M3. In summary, the major route of metabolism for oseltamivir in the rat is ester hydrolysis to the active neuraminidase inhibitor GS4071 (Fig. 4). Oseltamivir also was metabolized to an (R)-ω-carboxylic acid metabolite. The initial step in the formation of this metabolite appears to be ω-hydroxylation mediated by cytochrome P-450. No oxidative metabolites of oseltamivir have been observed in humans, either in vitro or in clinical studies (H. Whiltshire, personal communication), indicating that cytochrome P-450 is not involved in the metabolism of oseltamivir in humans. Scheme of oseltamivir metabolism in the rat. ↵1 Current address: Roche Discovery Welwyn, Hertfordshire, UK. ↵2 Current address: Xenoport, Palo Alto, CA. (1989) The neuraminidase of influenza virus. Proteins 6:341–356. (1984) In vitro metabolism of mono-2-ethylhexyl phthalate by microsomal enzymes. Similarity to ω and ω-1 oxidation of fatty acids. Drug Metab Dispos 12:742–748. (1948) Mucin and mucoids in relation to influenza virus action, IV: Inhibition by purified mucoid of infection and haemagglutination with the virus strain WSE. Aust J Exp Biol Med Sci 26:381–387. (1991) Omega-oxidation of fatty acids studied in isolated liver cells. Biochim Biophys Acta 1081:167–173. (1997) Penetration of GS4071, a novel influenza neuraminidase inhibitor, into rat bronchoalveolar lining fluid following oral administration of the prodrug oseltamivir. Antimicrob Agents Chemother 41:1949–1952. (1971) ω-oxidation of fatty acids. I. Mechanism of microsomal ω1- and ω2-hydroxylation. J Biol Chem 246:7411–7416. (1997) Influenza neuraminidase inhibitors possessing a novel hydrophobic interaction in the enzyme active site: Design, synthesis, and structural analysis of carbocyclic sialic acid analogues with potent anti-influenza activity. J Am Chem Soc 119:681–690. (1993) Induction of (omega-1)-oxidation of monocadoxylic acids by acetylsalicylic acid. J Lipid Res 34:1187–1199. (1999) Stereospecific synthesis of GS4104 metabolite; Determination of absolute stereochemistry and influenza neuraminidase inhibitory activity. Bioorg Med Chem Lett 9:2811–2814. 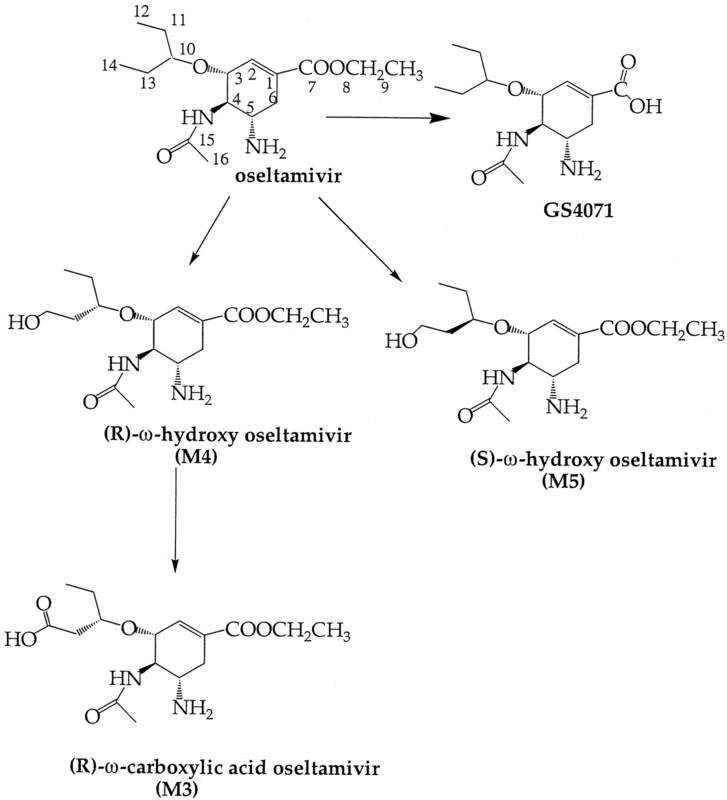 (1998) Identification of oseltamivir as an orally bioavailable prodrug of the influenza virus neuraminidase inhibitor oseltamivir. Antimicrob Agents Chemother 42:647–653. (1976) Inhibition of influenza virus replication in tissue culture by 2-deoxy-2,3-dehydro-N-trifluoroacetyl-neuraminic acid (FANA): Mechanism of action. J Gen Virol 33:159–163. (1966) Functional significance of sialidase during influenza multiplication. Virology 30:731–737. (1996) The omega- hydroxylation of lauric acid: Oxidation of 12-hydroxylauric acid to dodecanedioic acid by a purified recombinant fusion protein containing P450 4A1 and NADPH-P450 reductase. Arch Biochem Biophys 330:199–208. (1997) In vitro and in vivo disposition of 2,2-dimethyl-N-(2,4,6-trimethoxyphenyl) dodecamide (CI-976). Identification of a novel five carbon cleavage metabolite in rats. Drug Metab Dispos 25:123–130. (1993) Specificity of substrate and inhibitor probes for human cytochromes P450 1AI and 1A2. J Pharmacol Exp Ther 265:401–407. (1998) Prolongation of the QT interval related to cisapride-diltiazem interaction. Pharmacotherapy 18:381–385. (1994) Use of midazolam as a human cytochrome P450 3A probe: I. In vitro-in vivo correlations in liver transplant patients. J Pharmacol Exp Ther 271:549–556. (1998) In vitro and in vivo drug interactions involving human CYP3A. Annu Rev Pharmacol Toxicol 38:389–430. (1999) Review article: Cardiac adverse effects of gastrointestinal prokinetics. Aliment Pharmacol Ther 13:1585–1591. (1998) The influence of cisapride and clarithromycin on QT intervals in healthy volunteers. Clin Pharmacol Ther 64:542–546. (1999) The role of cisapride in the treatment of pediatric gastroesophageal reflux. J Pediatr Gastroenterol Nutr 28:518–528. (1999) The risk of serious cardiac arrhythmias among cisapride users in the United Kingdom and Canada. Am J Med 107:356–362. (1996) Cisapride and fatal arrhythmia. N Engl J Med 335:290–291.